Here’s one of the latest trends in nails: It’s inspired by Serena Williams so OPI has called it “The Grand Slam” collection. The shade “Black Shatter” is what’s so unusual because, when applied, it creates a crackled effect. It’s kinda subtle when painted over red, but when layered with gold, yellow or, as Serena would have it, a shimmering chartreuse, it definitely makes a statement. 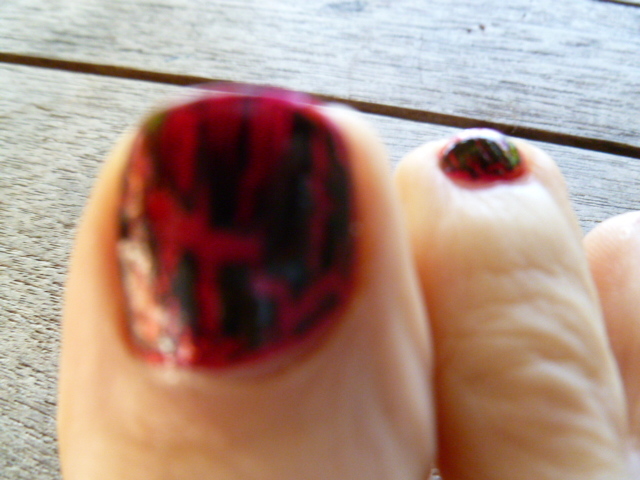 My pedicurist, Michele Lee at Reneux Medi Spa, put it on my toes. You can ask your manicurist or pedicurist for the “Shatter” or “Crackle” look or buy the nail enamel at a store that sells OPI and try it yourself. This entry was posted in On Our Radar and tagged Michele Lee, OPI, Serena Williams. Bookmark the permalink. It’s very interesting to see this trend come to nail polish. I’m not sure if you remember the pictures of my rennovated room I sent to you, but the walls of my room have this same concept. Matte red over a walnut brown. I wanted bigger “cracks” along my walls, so I took a flathead screwdriver, and literally dragged it along the walls. It turned out amazing.